Denner & Vaughan Ltd were a mid-20th century company of glove manufacturers founded in 1950 by Linsey Arthur Denner, known as Arthur, and Sidney John Vaughan, known as John. They were originally based in Preston Park Close and were advertising for staff there, certainly in 1950 when the advertisement illustrated below was published. The company were listed as glove manufacturers of Preston Park Close in Edwin Snell's Directory of 1954. A fully owned subsidiary of Denner and Vaughan, the Poole Glove Company Limited, was established in Sterte Avenue, Poole, Dorset in 1954 and the company built a specialised factory there in 1955. In 1960 the company moved to the first floor of the administration block of the Nautilus Works (see Gallery), Reckleford, and were listed in Foord's Directory of 1964. They were listed as glove manufacturers of 23 Reckleford in the 1968 edition of Kelly's Directory, a listing repeated in Kelly's Directories until 1974. Denner and Vaughan were the winners of the award given by the Worshipful Company of Glove Makers for the best export performance of 1972/73. The cup was presented at the British Glove Fair in February 1974. (the runners-up were Freke & Gifford). In 1972 the company were recorded as having 35 staff. Denner and Vaughan was finally wound up in 1976. I am most grateful to John Vaughan's son, Brian, for sending me the following photographs and for permission to include the history of Denner and Vaughan. For the complete fascinating history of the company including its foundation and the struggle to establish a new company in post-war Britain, the golden years and the gradual decline - written by its founders Arthur Denner and John Vaughan - click here. Linsey Arthur Denner (left) and S John Vaughan were partners from 1950 to 1976. 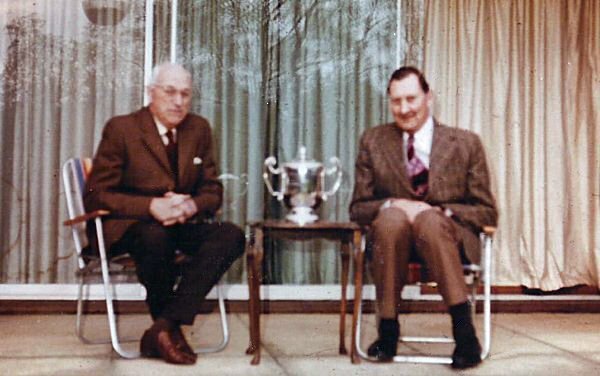 They are photographed here with the cup given by the Worshipful Company of Glove Makers for best export performance, 1972/73. The brass plaque that was fixed to the Denner and Vaughan factory. Advertisements placed in the Western Gazette during December 1950. (A brosser was a modified whipstitch). 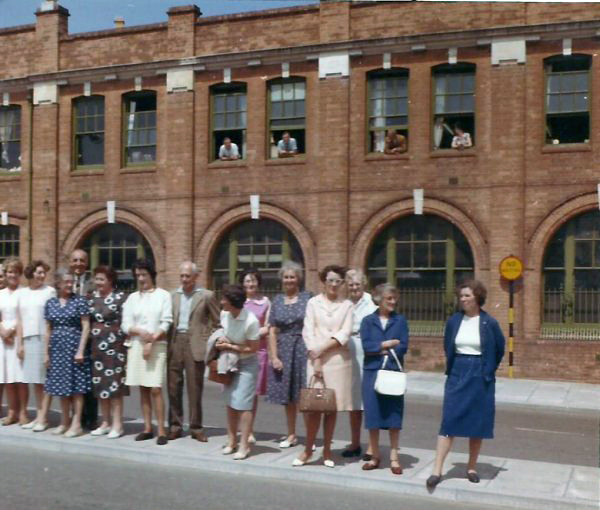 Denner and Vaughan staff pose outside the company's works on the first floor of the Nautilus Works, Reckleford, in 1964. 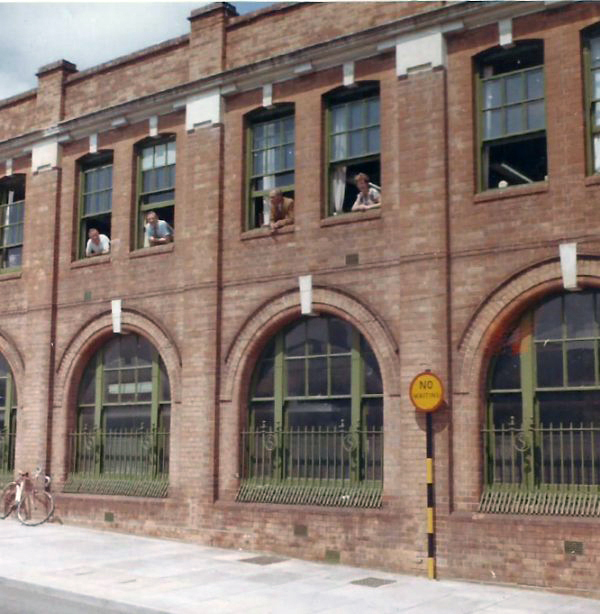 Another shot of the Denner and Vaughan works in the Nautilus Works in 1964. 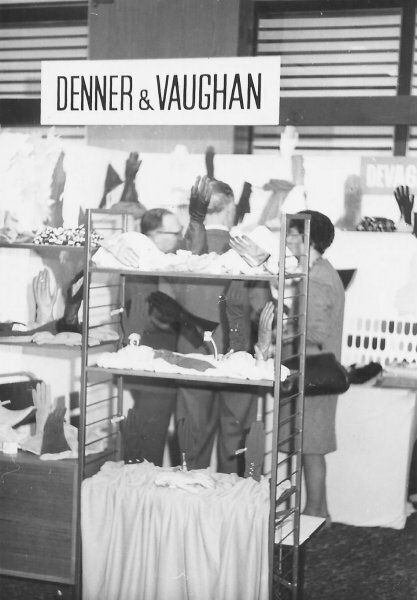 Denner and Vaughan gloves in 1964. 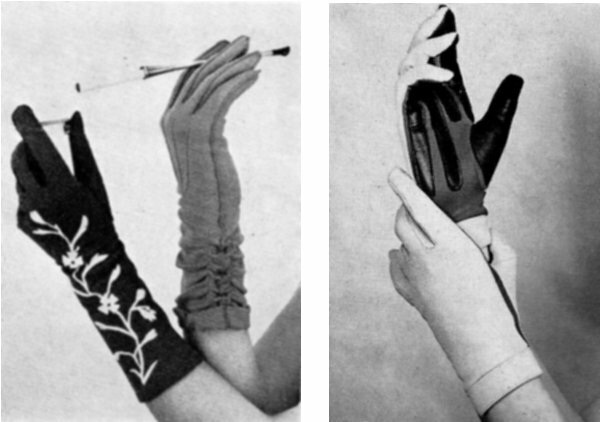 At left fashion gloves (don't you wish they'd make a fashion come-back?) 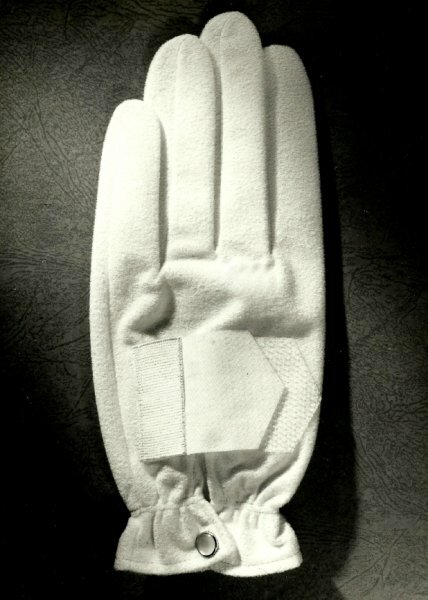 and at right what was described as "Denner and Vaughan's new feminine washable driving glove with a maximum-grip leather and nylon palm and crimp nylon "waffle" knit back. Colours are black and fashion shades." 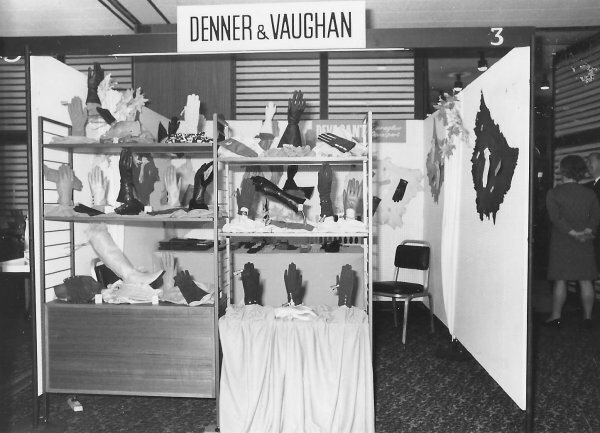 The Denner & Vaughan exhibition stand at the 1965 British Glove Fair. 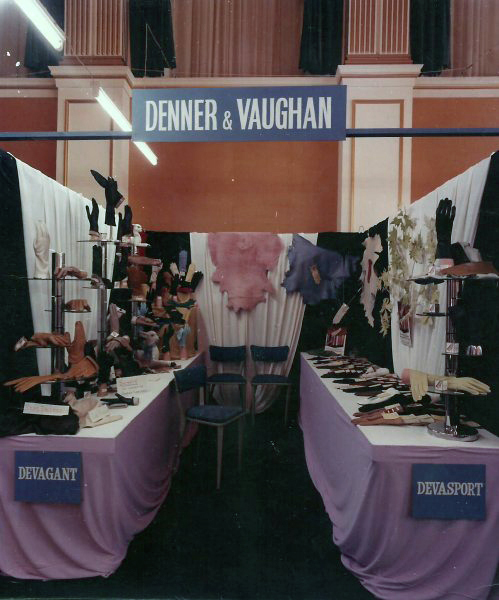 The Denner & Vaughan stand at a similar exhibition in 1968. A full view of the Denner & Vaughan stand in 1968. A Denner & Vaughan golf wet weather glove. 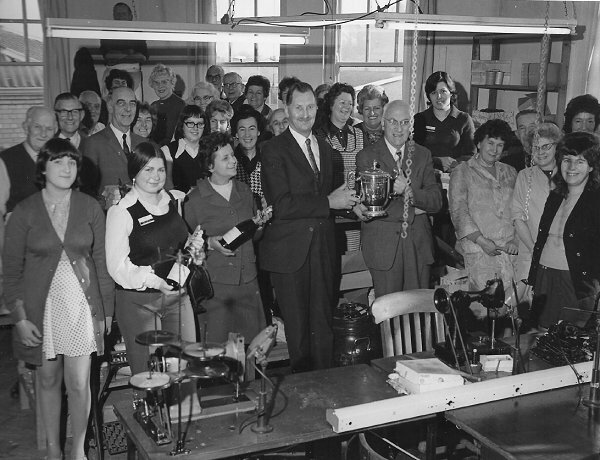 Staff of Denner and Vaughan celebrate winning the Export Challenge Cup, donated by the Worshipful Company of Glovers of London to the British glove manufacturer with the best export performance for 1972/73. The cup was presented at the British Glove Fair in February 1974.